Born in Brooklyn, New York, Emanuel Xavier is the author of the poetry collection Americano, editor of Bullets & Butterflies: Queer Spoken Word Poetry and Mariposas: A Modern Anthology of Queer Latino Poetry. He also selected finalists for Best Gay Erotica 2008. 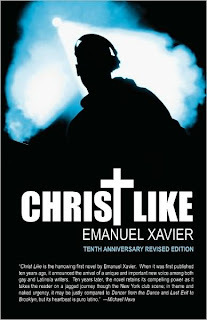 The tenth anniversary revised edition of his novel, Christ Like, was recently published by Queer Mojo and is (hopefully) available at LGBTQ bookstores everywhere. Regarding Emanuel's novel, Christ Like, the publisher says: "Mikey is a spirited but self-destructive survivor of sexual abuse, a gay Latino native New Yorker caught somewhere between Catholic guilt and club kid decadence looking to fit in as part of a family. Instead, Mikey delves into a demimonde of petty thieves, prostitutes, and pushers. Haunted by a father that Mikey has never met, a difficult childhood, recurring nightmares, the reality of death, and Christ, the story unfolds through the '80s and '90s following him on his journey through a fascinating world filled with Santeros, transsexuals and voguing queens." DANIEL OLIVAS: Have you noticed a change or evolution in LGBTQ literature during the last decade since your novel Christ Like was first published? If so, how has it changed or evolved? EMANUEL XAVIER: There have been many changes in LGBTQ literature in the past decade for better and for worse. On the one hand, more people take advantage of purchasing their books over the internet, which has made titles available on a larger scale and more accessible for those who feel uncomfortable shopping for an LGBTQ title at a bookstore. However, this and the major chains have also caused the unfortunate demise of many queer bookshops. Unless you have the fan base of an Augusten Burroughs or your book is published by a major publishing house, chain bookstores will not bother carrying a single copy of most independent ly published queer titles while still ordering several quantities of others, which end up on the remainder bin. Therefore, on the one hand, there is more opportunity to reach a wider audience on questionably LGBTQ supportive sites such as Amazon and on the other hand, there is less visibility on actual bookshelves. The few queer bookshops that still exist throughout the country are genuine gems to our community, which should be supported as much as possible. 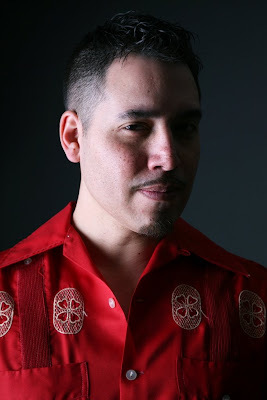 OLIVAS: The novelist Michael Nava has noted in interviews the tension between his identities as a Latino writer vs. his identity as a Gay writer. Such tension usually comes from straight Chicano/Latino writers' less than accepting attitude toward LGBTQ writers, though this seems to be changing. What has been your experience? XAVIER: My own personal publishing experience would have me believe that I will never achieve the level of success of my fellow Latino literary peers and contemporaries because my queer identity creates unfortunate limits. I agree with Michael that it is more of a challenge for us because there continues to be much homophobia within the Latino community so it is difficult to reach that audience. However, I sometimes get letters and emails from straight male Latino fans that could care less about my sexuality and relate to my work as a writer. I have had strange occurrences like being asked for permission to reprint one of my poems in a newsletter for The Almighty Latin King & Queen Nation, being invited to perform for inmates at Riker’s Island Prison and even appearing on Russell Simmons presents Def Poetry. I think those that are secure enough in their masculinity and genuinely cool enough to accept the differences in people appreciate and enjoy a better sense of humanity. It is important for writers like Michael Nava and so many others, like me, to continue sharing our experiences and expressing ourselves as writers because it is the only way we could tear down these boundaries and share in our universality. Some of my poetry is political and cultural and not all of my work is queer specific but, as an openly queer artist, I occasionally wonder what it would be like to be a closeted Latino writer. I suppose I will never know the answer to that but I imagine it difficult trying to come across as something that you are not. OLIVAS: What was your inspiration for creating the character of Mikey? Would you write a different novel today if you were to approach Mikey in 2009? XAVIER: By my own admission, there is a lot of myself in Mikey X. The tenth anniversary edition is edited as more of a memoir but remains a fiction novel. If I wrote the novel today, it would probably be approached differently because I have had more experiences in life that have provided me with more opportunity to reflect on who I was back then. Originally, I wrote this book to come to terms with the mistakes I had made in life and make some sort of sense of them. I learned a lot about myself through this publication. Ten years later, it is nice to be able to look back and laugh at myself. However, I chose not to revise it too much for thi s publication because it is who I was as a writer at the time and it is, after all, Mikey’s story so I wanted to keep the language authentic to the character. OLIVAS: Can you describe some of your more memorable experiences (good or bad) doing public readings of Christ Like? XAVIER: It is a bit of a challenge for me because most of my career has been as a spoken word poet. It’s different reading a series of poems, which are often political, and reading excerpts from a novel with the purpose of selling the book to an audience. You have to select scenes that stand on their own or establish the characters, which is unlike reading a poem that has its own beginning and end. I naturally prefer to do reading events as a spoken word poet but I’ve been having fun sharing excerpts from the novel which have a lot of dialogue which I could play with and act out for the audience, if not my own entertainment. A lot of the novel is very dark and depressing so it’s humorous for me to read excerpts with a lot of Spanish dialogue. I don’t always bother to translate because I think the non-Spanish speaking audience members understand from my gestures and tone of voice what that character is trying to say. If they don’t, it’s amusing to look out and see the expressions on their faces. It’s so wrong but it’s funny because it’s true. OLIVAS: Are you working on any new projects? XAVIER: I am collaborating with producer El David on a compilation CD featuring my spoken word poetry accompanied by music. Many people have approached me about doing this throughout the years but, coincidentally, it took one of those cool straight guys (and former member of the Latin Kings) to make it happen. However, to maintain my pseudo reputation as a rebellious queer writer living on the edge, I also have a new poetry collection coming out from Floricanto Press before the end of the year appropriately titled (ahem) - If Jesus Were Gay & other poems. We’ll see if Barnes & Noble carries that one! Horse Dance Underwater, with its strange and magical title, contemplates and celebrates "the moment before it's gone," because before an event locks itself into the immobility of memory or the past, it thrives with possibility. ◙ A new online literary journal, The Coachella Review, is now live. Aside from having tasty literary treats such as an interview with Billy Collins, the editors have been kind enough to publish one of my sudden fictions entitled, Orange Line. If you have a few minutes, drop in, read (and hopefully enjoy) my story, and leave a comment under it, just so they know people are reading. Also, consider submitting your fiction, non-fiction and poetry. Who are the top movers and shakers in the gay, lesbian, bisexual and trans American Latino community? We tried to make our list as comprehensive as possible including suggestions from different editors in the office as well as some polling of our dearest blogger friends. That said, we probably missed someone. The good news is, we make lists like this all the time -- See our 7 LGBT bloggers to watch -- so, there's a solid chance that your nominee will be included in an upcoming list. Names are listed in alphabetical order by last name. The numbers do not represent a ranking order or countdown. 4. Nilo Cruz, Playwright: Nilo Cruz was the first Latino to win a Pulitzer Prize for Drama in 2003 for his play Anna in The Tropics. The play was later adapted for Broadway with Jimmy Smitts in the lead role. That version of the play was nominated for Tony Award in 2004. 9. 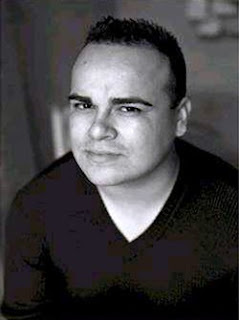 Rigoberto Gonzalez, Author/Critic: Gonzalez (pictured) is an award-winnin g author of poetry, fiction, nonfiction, and bilingual children's books, and self-identifies in his writing as a gay Chicano. He is also contributing editor for Poets & Writers Magazine, an executive board member of the National Book Critics Circle, and is on the Advisory Circle of Con Tinta, a collective of Chicano/Latino activist-writers. 15. Himilce Novas, Author/Activist: Novas has worked as a journalist, magazine editor and publicist for Vanidades, The New York Times, The Connoisseur, and The Christian Science Monitor. As a human rights activist, Novas was a founding member of the National Organization for Women. She continues to work on behalf of women and those in the GBLT community and was featured in the book Feminists Who Changed America. 25. 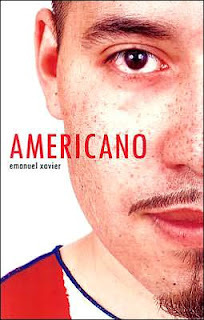 Emanuel Xavier, Poet: He transitioned himself from being a street hustler and a drug dealer to become one of the most significant and unlikely voices to emerge from the neo-Nuyorican spoken word movement using political, sexual and religious themes throughout his work.